Little Xerxes* loitered at the end of my lesson last week. He is a pensive child who is constantly frowning, as though he is thinking about something really thorny. X: Miss, can I ask you a phipholosical question? X: Oh, yes, a [slowly and carefully] phil lo foss ick al question. Me: Of course, X - go ahead. X: Well, I was wondering....how did we decide that down is, well, down? Imagine my face. Go on, I dare you. X: I mean, imagine if the person who came up with it decided that up was down instead of down being down, and then we'd have everything facing the other way, and it would all be, yknow, upside down. Me: Um, well X, I think that maybe we didn't decide that down was down. I think maybe gravity decided that down was down. X: (face clears of frown momentarily) Oh! GRAVITY! Of course! Next week I'm going to ask him how he knows that the colour he sees as blue is the same as the colour I see as blue; the week after: can you jump in the same river twice? * not his real name, but not far off. I saw this sock kit ages ago and kept going back to it until I finally bought it. 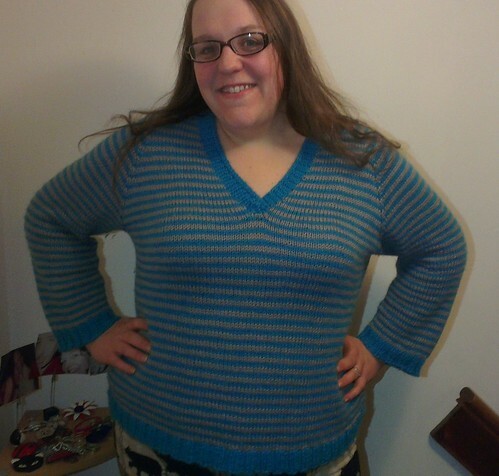 I put it on my project wishlist last April (curiously, I note, right after the stripy jumper I detailed in last week's post...it wasn't my plan to do them in order), and finally got round to pulling it out at the end of December. I was mildly horrified to see that the card in it wished me a happy new year - how can I have wanted a kit for so long and then leave it languishing for a whole year?! Oh yes. Life, etc. So I got Mr Z to wind the yarn for me and then I cast these on on Saturday at knitting group. I also cast on a laceweight tunic I have intended to start since last April, but then it turned out that these were what I wanted to knit for preference. Funny how it goes. I couldn't stop until I got into the red yarn, although today I realised I was patterning over the sole as well as the instep and had to rip it back. Boo. Luckily I had only done a row and a half. I really love knitting socks two at a time on one circular. They may not be very much of anything yet but I felt very accomplished having something I could put on both feet at the end of a couple of hours of knitting. You can still get the kit if you love watermelons as much as me. I didn't get whacked for import duty on this one, either - I think it must come in just under the threshold. New Year's Resolution: Get a new pose. Yarn: Knitpicks Elegance, about 4 balls. Alpaca Select DK, 2 and a half balls. Mods: I knitted it longer, of course. The cuffs and bottom ribbing I did 2x2....srsly hate 1x1 ribbing and I didn't want it to cling. It's alpaca so I think it would look wrong if it was clingy. I actually finished this last weekend (the whole lot was done and blocking within two weeks! Go me!) but I have been waiting all week to get pictures of me wearing it in daylight. Hasn't happened yet, so I thought I'd better post it! Usualy comment about the colours being a bit brighter IRL. When I tried it on, Mr Z commented that I got bored knitting the sleeves because they were a lot shorter than I had intended to knit them, but I was worried they were grow - and they did, significantly, so they are just on the long side of the perfect length now. On reflection it would have been difficult to add long cuffs with thumb holes and get them in the right place, and I think it ould have made the piece less wearable. The neck ribbing unfortunately distorted the stripes when I first finished it so I had to do some fiddly fake knitting with a darning needle to try and fix it, and then it blocked out better. It's still a little wobbly but then, I can't see it when I'm wearing it and I don't know if anybody would be staring at my chest hard enough to notice. Oh, and I've just realised that if they do, I can embarrass them by pointing out they must have been staring at my chest to notice. Win. It's ever so slightly itchy, which surprises me; it's quite a loose gauge though so it's unlikely I'll wear it next to my skin anyway. Before Christmas one of my ex-colleagues posted a Buzzfeed on my Facebook wall of lots of amazing cookie recipes, with a request for a batch of one of the recipes. Now, I don't have her address so I made some trite comment and moved on, but then I thought I could post them to her at work and it would still be a surprise. Also, I am a complete sucker for anything turtle. So, I have these to go in the post tomorrow. Beat the butter with the sugar until fluffy. Add the egg yolk, a tbsp of the milk and the vanilla; beat until combined. Sift in the dry ingredients and beat again until combined. Chill the cookie dough until it's cold - I left mine in there for an hour but it defo needed longer. Meanwhile, toast and chop the pecans. Toasting them is probably unnecessary because you're going to put them in the oven anyway, but I love that toasted pecan flavour and this gave me a full-on hit. When you're ready to bake, divide the cookie mixture into about two dozen balls, shaping them with your hands. I found the best way to do this was to roll the dough into two long sausages and divide each one into 12 pieces. Lightly beat the egg white and then roll the cookie dough balls in it. Using a pastry brush here helps. Then toss them in the chopped pecans until well coated (this bit was a lot of fun). Place on a greased baking sheet and press down with your thumb or some kind of implement so they are flattened and a bit indented. Bake at 180 degrees for 12-14 minutes, until they are lightly browned. Meanwhile, throw the unwrapped toffees in a small saucepan with the rest of the milk. Heat gently, stirring regularly, until the toffees are melted and the sauce is smooth. You probably don't want to let it boil. When the cookies are ready, remove them to a wire rack. Don't worry if the indents are no longer visible - this is the time for the trick like a brandy snap. Press your thumb or the same implement into the indents while the cookies are still hot and pliant (wait for them to cool a little unless you have teflon hands and don't press too hard) to remake the hollow. When cooled and crisp, spoon in as much of the caramel as will fit. Melt the chocolate with the groundnut oil. 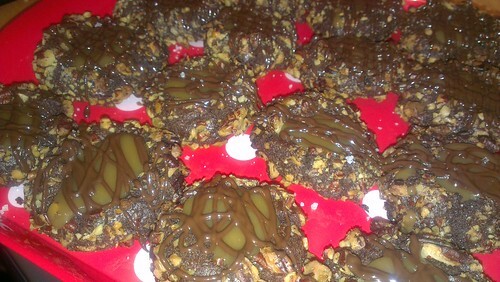 Put in a plastic bag and snip off the corner, then drizzle across the cookies. Box them up and send them to me a friend, and make their day. About a year ago, when I did my first detox with local nutritionist Claire Stone who I "met" on Twitter (if you're looking to detox I can highly recommend hers), I started drinking non-tea tea. I had a lot of it slowly aging in the cupboard and I started trying to drink it all up when I couldn't drink coffee anymore. That was when I discovered that green and white tea still has caffeine in it. But that was OK, because it made me experiment a bit more with other teas. I don't drink tea in the British sense of the world; but I do drink tea in the way the rest of the world means it. The only tea I don't drink is black tea, with milk. Black tea in general doesn't make me feel great, even when I drink it...er...black. Confusing. If I'm coming to visit, please just offer me white, green or peppermint, one of which most people seem to have hanging around. Anyway. (I seem to say that a lot). My favourite teas, at the moment, are made by Pukka. For a start they have beautiful boxes, which I find very appealing. Secondly, the bags are individually wrapped which makes them very portable, and the wrappers are quite sturdy. My favourite for most of last year was the vanilla chai. This winter, each time I put on a coat for its first wear of the season, I found a vanilla chai teabag in the pocket. This was good because it meant I had vanilla chai everywhere I went. It's naturally quite sweet and very aromatic. I stuck to my favourite for a while but now I also regularly buy the three ginger and the three cinnamon (not available in many places but so, so good). They're very good for school and drunk with a stir of manuka honey when my voice is going. Sometimes when I take my cup down after lunch I get a little group of students following me with their noses up, like little Bisto children. This Christmas break I have also discovered, and love, the revitalise (love cardamom so much these days) and elderberry and echinacea (which has a lot of elderflower in it, not that it says that on the label).